[Tip] Protect Your Eyes from Bright PC/Phone Display at Night. With the help of this tutorial, you can help protect your eyes at night against the display of both PC and your Phone. UPDATE : I’ve replaced the apps given heret with their better alternatives. I’ll not dwelve too much into how to use them as they are very simple to use. Still, if you get confused about how it works/how to use it, drop a comment below and your query will be resolved immediately. 2. Launch the app (when you are in a dark surrounding i.e usually at night). 5. Enjoy the night without burdening your eyes ! The app will keep a notification in the top when it’s started. Use it to configure the opacity of filter as per your needs. 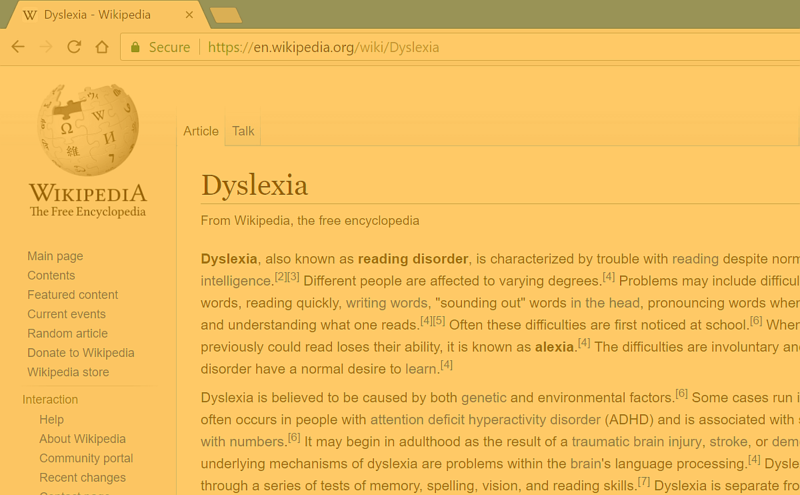 For example, if you are reading an ebook or Browsing net or using Whatsapp, you can keep the opacity of filter as high as 70~80% as all these activities have a white background. For viewing images or videos, opacity should be lower than that. 6. You can stop this app in two ways : Either through notification icon (as in image above) or launching the app and tapping STOP at the bottom of app (see image below). 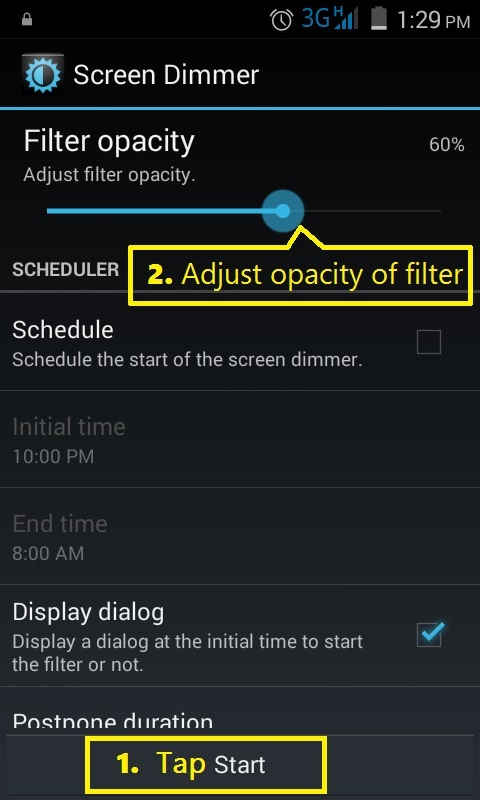 You can also schedule starting and stopping the filter so that you don’t have trouble of doing it manually every night. To do this, go to the app and enable a Schedule. 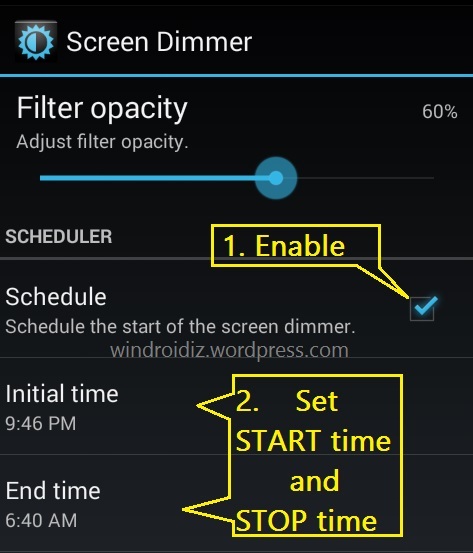 Now, set the Initial time (for starting the filter) and End time (to stop the filter). From here onwards, filter will be automatically applied and removed at the set interval everyday. If you also use your PC (Desktop/Laptop) at night, read ahead ! 2. Best thing about this software is that it doesn’t require any kind of installation. So, just extract the downloaded zip to any folder on your HD. 3. 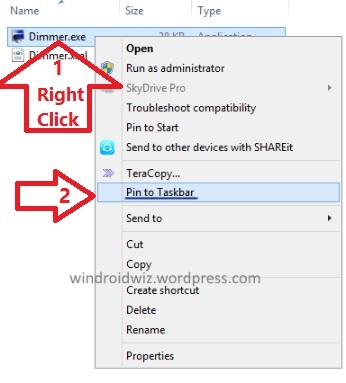 Right click a file called Dimmer inside the folder where you just extracted zip and select Pin to Taskbar. 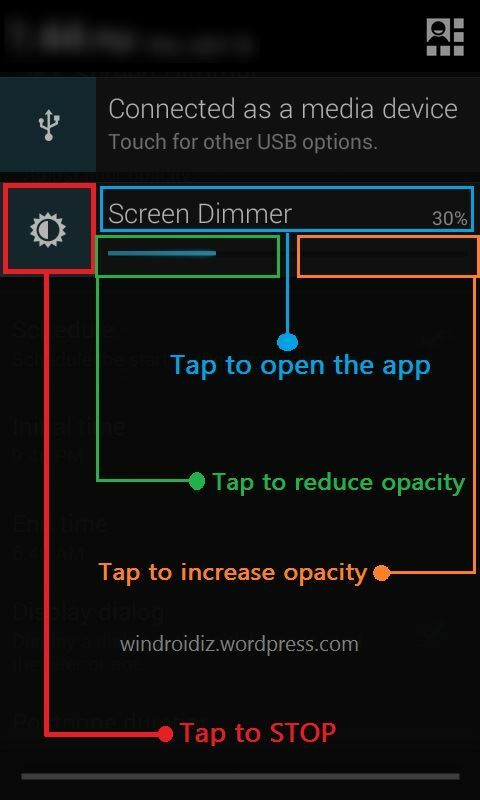 This will pin Dimmer to the taskbar. 4. Whenever you want to dim your PC’s screen below the minimum brightness, click Dimmer’s icon in Taskbar. Your screen will be dimmed immediately and you’ll see a Tray icon of dimmer . 5. To adjust the level of dimming, right click the Dimmer’s tray icon and select Configure. 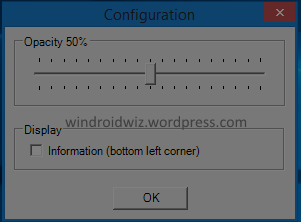 It’ll show a small configuration window. Use the slider to adjust Opacity of filter. (Higher value » Darker screen). Click OK after adjusting the level. 6. To exit dimmer, right click its icon in System tray and select Close. Another good thing about the Dimmer is that it doesn’t darken the taskbar and the mouse pionter. So you can easily see it’s icon, time & date, battery level (on laptops) etc. even if the rest of the screen is almost black. See the sample screenshots below to see its effect at 50% & 60% opacity. Note : Unfortunately, Dimmer doesn’t work on Metro (Modern) apps on Windows 8/ Windows 8.1 as it’s still in version 1.0. I hope the developer fixes this in its future versions. Now its time to enjoy using your PC at night like a real night owl !! Like WinDroidWiz on Facebook to get all the updates. [Trick]Pause/Resume ANY Task in Windows. [EXCLUSIVE][PORT] Download Moto Camera App Port for All Phones.